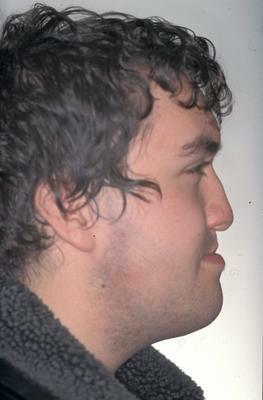 Cleft lip and palate are among the most frequent inborn malformations. 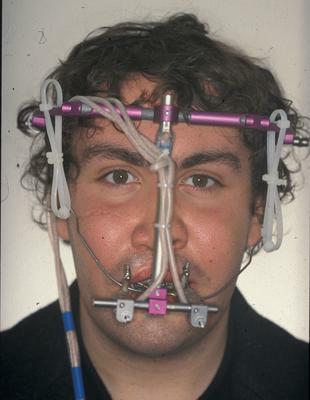 A resulting maxillary hypoplasia can be treated by distraction osteogenesis: During an operation the appropriate bony part of the midface is separated from the rest of the skull (osteotomy) and slowly moved into the ideal position by way of a distraction device (cf. Figure 1). 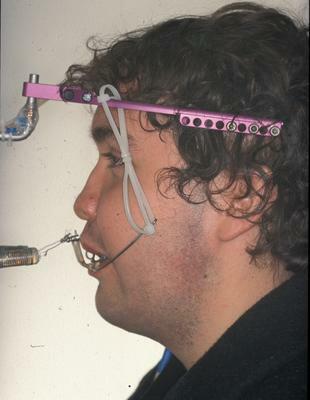 Thus even large displacements over 20 mm can be treated effectively. to visualize the results in an appropriate way (post-processing). It therefore provides the possibility to predict and compare the outcome of different surgical treatments in silico (see Figure 2). In line with the overall goals of GEMSS, this toolchain gives average clinicians access to the advanced simulation technology of such surgical planning tools. We chose to use a loose coupling of components for solving the individual tasks, which results in a very flexible and extensible approach. Some of these tasks are discussed in more detail below. We have built our virtual bone cutting tool on top of OpenDX, which is a very flexible visualization system with a graphic programming language and sufficient interactive power. We added some specific modules to OpenDx to realize interactive drawing of osteotomy lines on the bone surface. Demos are available for the cutting (3MB) and the distraction (2.6MB) steps in the osteotomy tool. For both surface and volume mesh generation, we use the octree-based mesh generation Vgrid and its successor Mesh&More which is a NEC inhouse development. Some of the algorithms are explained in [Berti2004]. 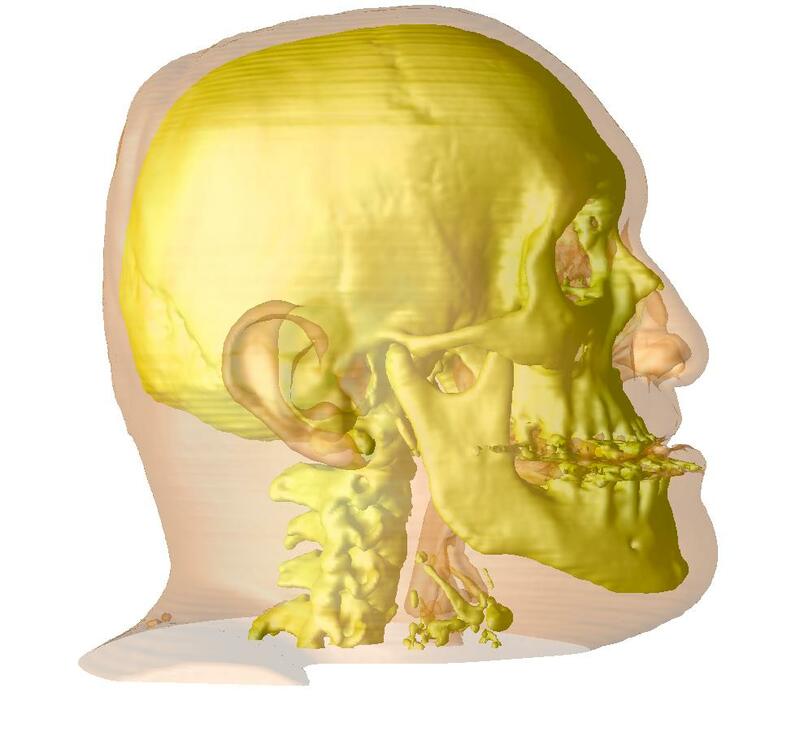 We use our inhouse parallel FEM code FEBiNA (Finite Elements for Bio-Numerics Applications) for simulating the distraction in maxillo-facial surgery. This code is used for linear and nonlinear FEM calculations, where nonlinear means as well geometric nonlinearity as material nonlinearity (hyperelastic, viscoelastic). Using a material model like viscoelasticity is crucial for obtaining reliable transient behavior with respect to forces [Schmidt2004]. The final result can be visualized using volume rendering (Demo (3.5MB)). G. Berti: Image-based unstructured 3D mesh generation for medical applications, in proceedings of ECCOMAS 2004. 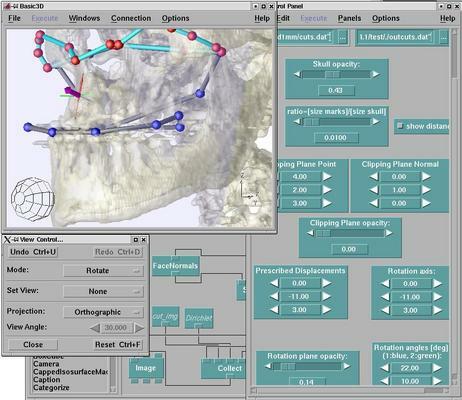 J. G. Schmidt, G. Berti, J. Fingberg, J. Cao, G. Wollny: A Finite Element Based Tool Chain for the Planning and Simulation of Maxillo-Facial Surgery, in proceedings of ECCOMAS 2004.